A printer has become an essential part of our everyday lives, serving a range of purposes at home or in the office. Due to the rapid advancement in technology it is easy for one to procure a printer which is easy on the pocket and yet get the benefit of all the facilities. The printer we are reviewing today is the PIXMA G2000 series by Canon, which has the revolutionary ink – tank technology. The Canon PIXMA G2000 is a multi-function all-in-one ink –jet printer that offers the print, Xerox and scan features. Ink Jet printers, although slow at printing, are cheaper on the pocket as compared to laser printers. Typically, there printers are perfect for personal use purposes. However, the PIXMA G2000 with its innovative ink tank technology is ideal even for office uses and bulk printing. Perhaps, the main feature of this printing device, which sets it apart from the ink – jet printers is the refillable ink tank technology which the appliance comes with. The ink tank bottles are high yield and they can print anywhere around 4000 to 5000 pages, thereby reducing ink cartridge costs by leaps and bounds. The ink tank is inbuilt in the printer body, and one can assess the level of ink remaining by just looking at the device. The device consumes 100 to 240 v of power depending on whether it is on standby, only plugged in or in copying mode. Ink tank bottles of the series GI – 790 are used for this printer, easily available online and at local stores housing printer supplies. The PIXMA G2000 has a compact body which also houses the ink tanks. Overall, the device looks visually appealing and does not occupy any unnecessary storage space. The paper tray is at the rear and paper can be loaded easily onto it. At one go, about 100 sheets of paper can be easily loaded on to the rear tray for printing. It also supports A5, B5, 5*7 & 4*6 paper sizes apart from the usual A4 size. It can also support photo paper, envelops and letters. When not in use the rear tray is collapsible, thus saving storage space. The document tray to load documents for scan or Xerox, comes with a platen glass. After placing the document in the tray and closing the tray’s lid, one needs to just press one of the start (colour / black) buttons to facilitate the process of Xeroxing or scanning. On the operation panel are the start button (used to switch the machine on or off); the start lamp (indicates if the machine is on or not); the alarm lamp (flashes when printer is out of paper); ink lamps (lights up when printer is out of the ink – black or colour); stop button (to abort an ongoing print / Xerox / scan operation); and start buttons (to facilitate Xeroxing in colour or black). The device comes with a USB cord to facilitate printing through the computer and a charging plug. A CD drive helps to install the printer onto the host computer. The size of the printer is 445 (w) * 330 (d) * 163 (h) mm and weighs approx 5.8 kg. Ink usage: The biggest plus point of this printer is the low ink usage and high volume printing, whether coloured or grayscale. With the ink tank technology, printing costs are the lowest so one can print as much as they want without thinking twice. Around 5000 pages can be easily printed on a single refill. What’s more? With easy to see transparent ink tanks inbuilt and positioned toward the centre of the printer one can conveniently assess the ink levels and therefore refill the inks easily. Just to give you an idea; I print around 5 to 10 pages every day, mixed with some coloured photos or certificates and my printer’s ink tank which was filled in mid May is still running as of today when I write this review (mid July) and further, is far from getting over for at least another month or so. Print Quality: The maximum printing resolution is 4800 (h) * 1200 (v) dpi; which is very crisp and clear. Colour accuracy and sharpness of the printed material is good. Further, the ink on the paper does not smudge when using a highlighter pen on it. If water is dropped on the paper immediately after printing, there are chances of the ink running but once the ink is settled, a stray drop of water will mostly not smudge the ink. The photo print quality is of utmost quality. I was told by the seller that the photo print may not be professional, but I beg to differ. The ink does not smudge, the pictures are sharp and clear and as good as the prints I would obtain from a local printing shop. Unfortunately, I have noticed that several times, ink blots on the paper while printing but more so while Xeroxing, after only 2 months of usage. Print Speed: The printer has an ISO Standard print speed (A4): up to 8.8ipm (mono) / 5.0ipm (colour) and claims to print borderless photos in 60 sec. Now this is one area where I have faced certain issues. The printer takes roughly a minute to start up, that is from the point the power button is switched on, till the printer gets ready to print, it takes roughly 60 sec to do so. Once ready, printing any kind of document on any kind of paper is fairly quick; for instance, a text only A4 page is churned out in around 20 sec. Even the Scanning is very quick and depending on the document / photo to be scanned is almost always done within 30 to 40 sec. The problem lies with Xeroxing. The device almost always takes 1 to 2 min to produce its first Xerox of the day. So you need to be patient and give the Xerox instruction and go about your other work. After the first Xerox however, the rest of the pages just flow. Ease of usage: The Canon PIXMA G2000 is easy to use with simple features and has conveniently placed buttons to access these features. It is best, however, to have Canon service personnel install the appliance and refill the ink tank at least a first few times, as installing this printer is not as easy as installing a regular one with cartridges. The CD drive along with the printer installs an inbuilt Canon quick menu & Canon on-screen manual which contain detailed information about setting up, using and troubleshooting any concerns with the device. There is also access to the online manual by selecting the Detailed Manual link via the quick menu. One can quickly check the ink levels, product information, etc., by just clicking on the relevant buttons in the Canon quick menu on one’s desktop. Double sided printing is manual. Canon Servicing & Support in small towns is often dismal, so although this printer is a very good buy, one can only hope that the brush with Canon servicing occurs rarely. As personally experienced by the reviewer, they are good at the time of selling & setting up products but after sales services offered by Canon are weak. However, some other major printer brands are known to provide equally poor service help, especially in non – metros. Due to the Ink Tank technology, the appliance has really low running costs and gives high volume printing and as I have already mentioned above, the printing cost per page cannot get lower than this for home and / or office printing. This advantage, though, is true for all ink tank printers. 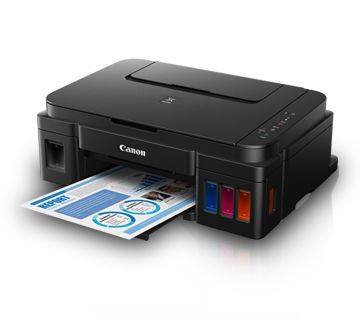 What sets the Canon printer apart is that, some other printers with similar technology don’t offer photo printing and therefore, even though similarly priced, one cannot print photos on similar ink tank printers. Further, due to the inbuilt ink tanks, the device looks sophisticated and does not appear bulky, once again an aspect missing from some of its counterparts which have ink tanks outside the main body of the printer. The ink refill bottles are reasonably priced at 500rs each, and therefore users can print uninhibitedly. Further, unlike other ink tank printers in the market, the Canon ink –tank printer comes with a black ink tank of 130 ml, almost double of what is offered by some other leading brands, simply because the black ink usage is double the color usage any given day. Ease of usage of this device cannot be overemphasized; the printer can be easily used even by young children. As already mentioned in the print speed section, the initial start up time of the printer and the printing time for the first Xerox after switching the device on, is a bit much for a modern printer. A major disadvantage of this device is that one needs to make sure that it is used every day or almost every day, otherwise there is the risk of the ink in the print head nozzles drying up. This can then be cleaned only by calling the service personnel who will then flush out the ink and make the printer usable again. Needless to say, apart from wasting time, this will also waste loads of ink. With so many features power packed in the PIXMA G2000, a key feature missing is the wireless printing feature. The ink tank printer is priced higher than regular cartridge printers, but still one need to shell out a few grand more if they want the wireless print feature. The absence of automatic double sided printing is also a dampener. Unlike the basic ink jet printers, where even if either colour or black ink was over, but one of the cartridges still had the ink, printing was possible (even though the printer was showing an error), in the ink tank printer, if even one of the four ink tanks has low levels of ink, printing will be stopped. This is a major disadvantage as sometimes one may run out of one ink but prints are still required. The device is one of the best bets for printing in the market right now with high quality prints, even of photos and graphics on glossy papers, in around 10,000 Rs. only. PIXMA G2000 carries a 1 yr. manufacturer’s warranty on the main printer body. A rating of 9 on 10 suits this device, simply because in its category, it is one of the best options around. To Recieve updates and possible rewards for Canon G2000 please sign in. To Recieve updates and possible rewards for Printer and Scanner please sign in.